These little ghost cupcakes are perfect for a Halloween party. Once again they’re definitely more cute than spooky, but I wouldn’t have it any other way! I’m really happy with how they turned out, and I just love the sparkly bows! These are a bit time consuming, but once you get the knack of it, they’re pretty easy. I made 12 regular size cupcakes and 24 mini cupcakes. While they were cooling I colored some fondant orange and black, and rolled it out. Using a 3″ ring mold I cut out 12 circles. I put a very thin layer of buttercream on the cupcakes and then placed the fondant on top. The buttercream is needed to make the fondant stick. 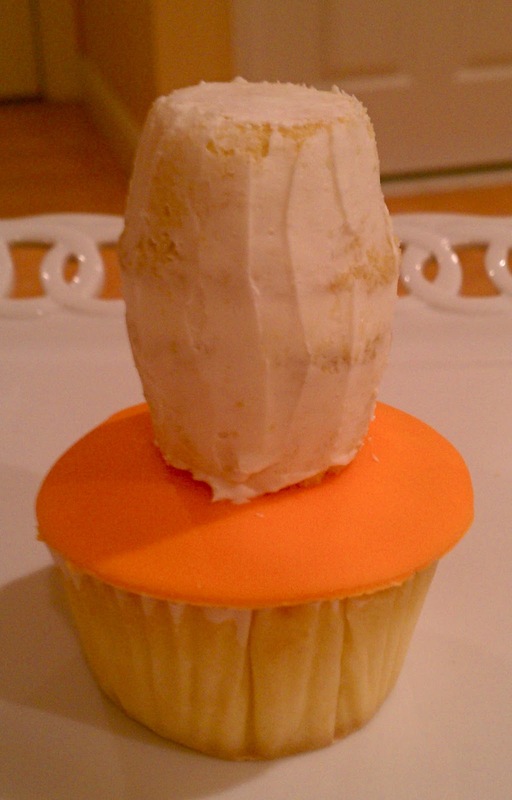 Next I stacked 2 mini cupcakes on top of each cupcake and placed a toothpick down the center to stabilize it. Once again I put a very thin layer of buttercream on the mini cupcakes and stuck them in the fridge. I rolled out my white fondant and figured out I would need my circles to be 4 & 1/2 – 5″ in diameter to cover the cupcakes. Luckily I had a margarita glass that was the perfect size! Make a small batch of buttercream. Color fondant – orange, black, & small amount of pink for the bows. Roll out the black fondant and using a 3″ ring mold or a wine glass cut out 6 circles. Repeat with the orange fondant. Frost the cooled regular size cupcakes with a thin layer of buttercream(this is just so the fondant sticks). Place the black & orange fondant circles on top of the cupcakes. Stack 2 mini cupcakes on top of each regular size cupcake and insert a toothpick through the whole thing to stabilize it. Frost all the mini cupcakes with a thin layer of buttercream. Once again this is so the fondant will stick and will prevent the cupcakes from drying out. Start to roll out the white fondant. Make sure you keep the cupcakes in the fridge while doing this. If they get too soft at any point, they will be difficult to work with. 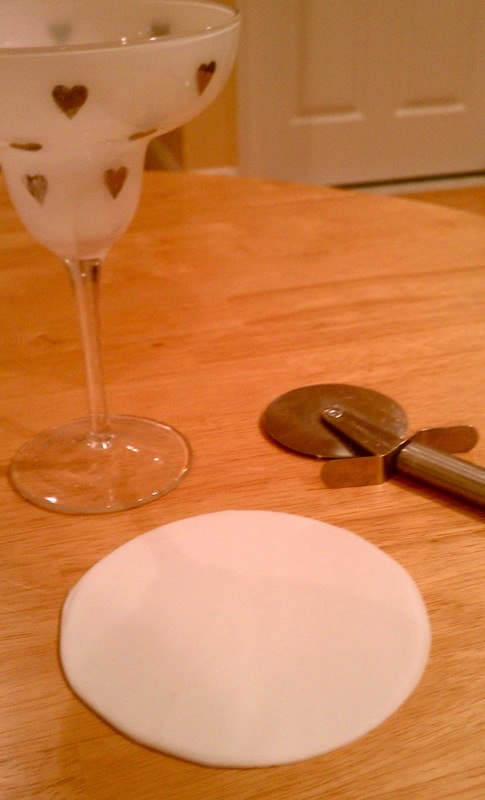 Using a glass that has a 4 & 1/2 – 5″ diameter cut circles out of the white fondant. Place the fondant circle on top of the mini cupcakes and let it drape. Using a paint brush dipped in food coloring paint faces on the ghosts. If you want to make girly ghosts make little bows out of pink fondant. When they are completely dry, brush them lightly with water & then brush the disco dust on. >These are so creatively cute! I like Casper, so I do agree that ghosts are not always mean and scary. I am sure you enjoyed putting these together also. The glittery bows are such a nice touch. Well done-have a great weekend! >very very creative and such a beautiful and adorable looking cupcakes. >These are just so darn cute! I LOVE the bow on top, perfect!! >those are totally perfect for a Halloween party!!! I love them! and the little bows on top! >Most definitely the cutest ghosts EVER! >Did you just hear a big "squee" a minute ago? These are so cool. I don't even have little kids and I want to make these. Love, love, love these! >Oh my god could these be any cuter?!? I LOVE those pink bows. Amazing!! >These are so stinkin' cute! I love their happy faces and the bows! >I'm normally pretty "meh" on halloween themed desserts, but these are so adorable and totally not creepy – sure to be a hit at any party! >WOW! These are fantastic! Perfect for Halloween. Check out our website sometime soon @ bloomeveryday.wordpress.com. 🙂 We would love to share some of our recipes with you. >Aaw, those are too cute! How creative! >These are SO cute and the bows! *sigh* what a creative idea! Every time I come here I'm surprised with one amazing pastry after another. You are amazingly talented! >These are too cute. Love it. >You are so talented! Love this! You are so good with fondant! >Oh my gosh they're so adorable! I love them 🙂 You always make the cutest things. >I'm loving this Halloweenie series! Just too adorable 🙂 LOOOOVE the bows! >They are definitely the cutest Halloween treat I've seen :-). >So girly and so you Meghan, great job! >Congrats for the Top 9!! Another work of art! My daughters were thrilled to see them :-)!! Simple to make and pretty!! >Wow! These are fantastic! Great job! >Super cute! I love their little sparkley bows. haha. Adorable! >aw! these are so precious. No wonder you made the Top 9 with these! >So darn cute, and not scary at all(which is a good thing in my books)! Now, I want to make cupcakes. >Congrats on Top 9 these are so super cute! >Oh I saw these the other day and thought they were the cutest thing ever! Love it! >Amazing! A simple idea could go a long way! I love those 'ghost' beauties! >Those are so cute and all the better because you get two extra mini cupcakes under the ghost!! >Aw how cute are those? >L O V E!!!! On top of being utterly cute you get to eat 3 cupcakes in 1- who doesn't like that?! >Super cute girl! Love them! How creative to stack two cupcakes. >These are so adorable!! Love all your creative ideas Meghan! 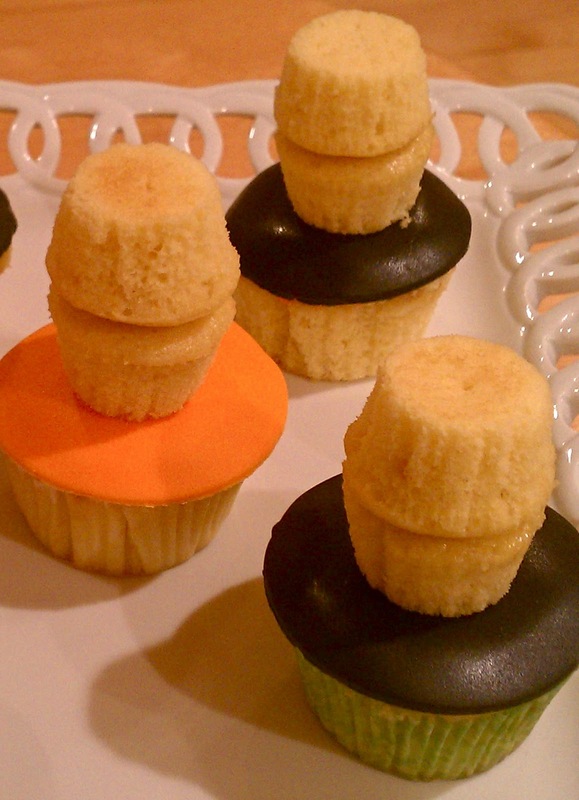 >These have to be the cutest, and sweetest Halloween cupcakes I have ever seen! You even gave them a "gender" and cute little expressions! Super Clever!!! Oh Meghan!!! These are absolutely adorable! So happy I was looking through your beautiful blog and found them! Amazingly cute holiday treats, Meghan! Your kitchen is always burgeoning with creativity – keep ’em coming! These are probably the cutest thing I’ve ever seen. I wouldn’t want to eat it. I’d just want to look at it. Hey disco dust lady, these are the cutest Hallowe’en spooks ever! Wooooooooooo! I prefer cute to scary too. Love them Meghan and you’re the best baker. Aw, thanks so much my friend!